I came across a very interesting dissertation on music supply chains that was successfully defended for a Masters degree recently in Bergen, Norway at NHH. The dissertation, written by Brandeis Bellamy, is entitled: How Has the Changing Demand for Downloadable Music Influenced the Strategic Business Models of Firms? and it can be accessed here. I thought to myself, what a fascinating application of supply chains and a topic that anyone (and especially college students) can relate to. I couldn't help but read the dissertation and was really surprised and pleased to see that my Supply Chain Network Economics book was cited in it. I wrote this book while I was a Fellow at the Radcliffe Institute for Advanced Study at Harvard in 2005-2006. Coincidentally, Elaine Chew, who is an outstanding pianist and an operations researcher, who studies music from a mathematics perspective, was a Fellow at Radcliffe in 2007-2008, and we had the pleasure of having her speak at the Isenberg School in our INFORMS Speaker Series that Fall. While reading the dissertation from NHH in Bergen, I so fondly recalled a doctoral dissertation that I was an examiner for, which involved travel to Bergen in northern Norway in the month of March. Bergen was magical with crocuses blooming and the defense is a very formal affair there with a reception afterwards (the student passed with glowing colors) and an elegant banquet. The defense was my second trip to Bergen. I had been there earlier for a NATO Scientific conference, after which we took the 7 hour train trip from Bergen to Oslo with spectacular views. Tomorrow, I will be an oral examiner (sounds as though I am a dentist) for a doctoral dissertation in Auckland, New Zealand. I will not be flying out (would have to be on a plane already, if that were the case) but will be videoconferencing. The videoconferencing technology we used to stream my lecture last May to UC Davis. Tomorrow we will be using it for a doctoral defense. I am keeping my fingers crossed that everything works out. The last time I was in Auckland, New Zealand was in January 2008 and the trip included being stuck at LAX on the tarmac in the plane for 4 hours in a fierce rainstorm before we took off for Auckland. The pain and suffering associated with this trip were compensated by the fantastic conference on Multicriteria Decision-Making and the conference talks, tours, and festivities. Above I share with you some photos of Auckland, New Zealand. It's never dull being an academic! It's the season of baking and what could be more fun before the end of the semester projects, presentations, and finals than to explore one's creativity in other ways. Once Thanksgiving is over and the turkey is fully digested, my daughter and I begin our holiday tradition of baking cookies for neighbors. This is quite the logistical operation, since we like to always include our tried and true recipes as well as to explore new ones. This year's cookie plates include: coconut chocolate-dipped macaroons, pecan shortbread logs, almond cookies with cherries, shortbread cookies, walnut rumballs, and what we call stained glass cookies (in star formation above), which are my daughter's specialty. The baking is great fun, as well as the wrapping, but the most fun is when my daughter delivers them door to door (always determining the most efficient route first and identifying when the neighbors are likely to be home). Since she listened (without choice) to my graduate lectures on operations research and management science while in utero she is a natural when it comes to organization and efficiency. Plus, as a child of faculty members, she does tend to absorb the material that we can't help but discuss. 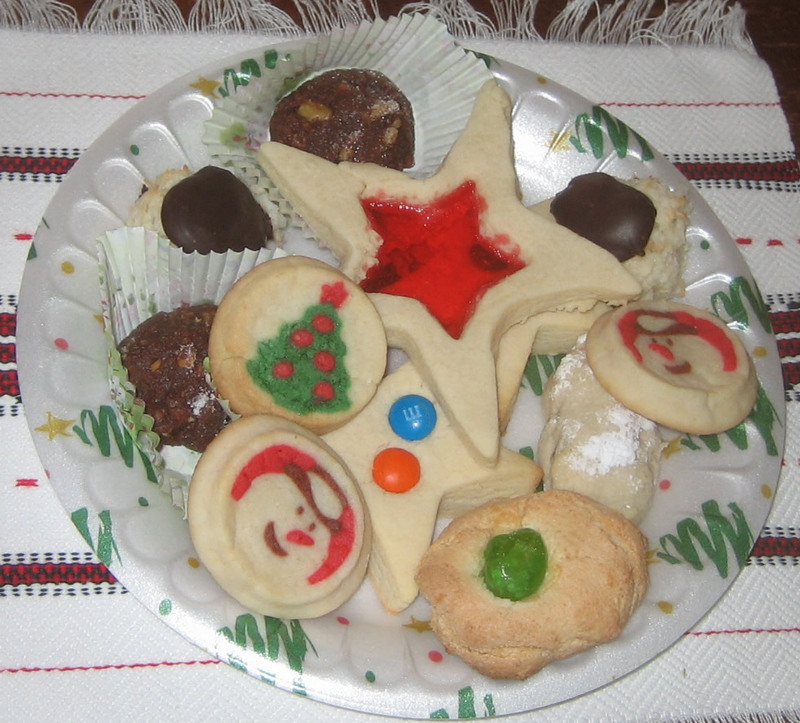 Plates of holiday cookies are a small way in which we acknowledge our terrific neighbors. As for the family larder, we will have to bake again to replenish the cookie supplies. We are delighted that Dr. Brian Levine of the UMass Amherst Computer Science Department will be delivering his lecture, Forensic Investigation of the Internet and Mobile Systems, this coming Friday at the Isenberg School of Management. With this lecture we conclude our 2009 Fall Speaker Series in Operations Research / Management Science. We have a terrific lineup for Spring 2010 and I hope that many of you will be able to join us. The announcement will be out soon. Below is the announcement on Professor Levine's talk that was prepared by the award-winning UMass Amherst INFORMS Student Chapter that I serve as the Faculty Advisor of. The last INFORMS Speaker Seminar of the Fall 2009 semester is scheduled for the next Friday, December 4, 2009. We are delighted to have Professor Brian Levine, Department of Computer Science, University of Massachusetts Amherst, who will speak on "Forensic Investigation of the Internet and Mobile Systems." includes awards from the National Science Foundation NETS, GENI, Trustworthy Computing, and SFS programs, DARPA's Disruption Tolerant Networking program, and the National Institute of Justice's Electronic Crime program. He received a CAREER award in 2002 for work in peer-to-peer networking, one of NSF's most prestigious awards for new faculty. He was a UMass Lilly Teaching Fellow in 2003 and was awarded his college's Outstanding Teacher Award in 2007. In 2008, he received the Alumni Award for Excellence in Science & Technology from his undergraduate alma mater, the State University of New York at Albany. He has served as an associate editor of IEEE/ACM Transactions on Networking since 2005, and is the co-founder of the ACM Northeast Digital Forensics Exchange Workshop. He received his PhD in Computer Engineering from the University of California, Santa Cruz in 1999.
investigations of murder, contraband trafficking, identity and intellectual property theft, fraud, and espionage have shown. source of new content on the network? Who is a trove of existing data? Ideally, these network characteristics can be linked to real criminological behaviors. As families and friends begin to gather to celebrate Thanksgiving, I wanted to take a moment to thank the teachers, from the preschool and elementary school ones, to the high school and college and university-based ones. Great teaching requires inspiration, dedication, enthusiasm, spirit, knowledge, stamina, humor, kindness, always showing up and being there, and love of teaching and the students. Great teachers teach through their knowledge of the material, their support of the students, numerous examples, hard work and feedback, and high standards and expectations. They make learning fun and have students take pride in their work. Great teachers have consciences and don't take the easy route -- they continue to raise the bar and see the joy in the students' eyes when the students "get the material." Great teachers also teach outside their classrooms through mentorship, the creation of opportunities, and life-long connections. How many times have I been told by former students that many of their happiest times and memories come from their days as students! I had the pleasure of being interviewed by Barry List, the Communications Director of INFORMS, while at the INFORMS Annual Conference in San Diego last month for a podcast on transportation networks and beyond and the podcast is now available here. Getting feedback and messages regarding the podcast has been quite interesting and fun. Today, for example, I received an email from a student who is now getting his Masters in Operations Research at the London School of Economics (LSE) who had enjoyed my podcast. While an undergrad at a college in Boston he had attended the Brown University SUMS (Symposium for Undergraduates in the Mathematical Sciences) in March 2007 when I was the featured speaker representing operations research. I spoke on Operations Research and the Captivating Study of Networks. He had enjoyed the topic so much that he visited me at UMass Amherst the following fall to discuss his interests in this discipline. Needless to say, I was delighted to hear from him today and to learn that he had matriculated as a graduate student in Operations Research at LSE! Today's NY Times has a feature article on the software powerhouse, SAS, which is based in Cary, North Carolina. The article traces its history and founding by Mr. Goodnight and three colleagues from North Carolina State University in 1976 and highlights how, even today, SAS allocates 22% of the company's substantial revenue to research and development. The article has links to SAS's gorgeous campus, which includes a pool, a daycare and preschool for employees' children, on-site medical care, and more! Of the 100 largest companies in the world, 92 use SAS software. However, SAS is now being threatened by such major corporations as IBM, which is investing billions of dollars in what is being called business intelligence software, for predictive modeling and analytics, which enhances evidence-based decision-making. With the tremendous increase in data availability through the Internet and sensors, companies are now increasingly understanding the huge untapped potential of operations research tools and statistical models and methods. The environment at SAS has fostered creativity but the competition is growing and SAS will be having to readjust to significant outside competitive pressures. The article discusses how SAS's leadership is planning on handling these new challenges. One of my former doctoral students, Dr. Padma Ramanujam, whose dissertation that I chaired, entitled, Transportation Network Policy Modeling for Congestion and Pollution Control: A Variational Inequality Approach, which received the 1999 dissertation prize of the (then-called) Transportation Science Section of INFORMS, is an employee of SAS. Dr. Ramanujam is also a Center Associate of the Virtual Center for Supernetworks that I am the Founding Director of. Dr. Ramanujam, after receiving her PhD with a concentration in Management Science from the Isenberg School at UMass Amherst, joined I2 Technologies in Richardson, Texas, and then moved on to SAS. SAS has had a very supportive environment for females and I would like to single out the work of Dr. Radhika Kulkarni of SAS, who received the 2006 WORMS (Women in Operations Research and the Management Sciences) Award of INFORMS. A year later, she chaired the same award committee when I was the recipient of the 2007 WORMS Award. We had a chance to reflect on the careers of females in technical industries and to also reflect on the nurturance of female doctorates. Some photos from the award ceremonies and festivities can be found here. In conversations with Dr. Kulkarni of SAS, so many wonderful memories came flooding back, including those surrounding the writing of the Environmental Networks book with two of my female PhD students, Padma Ramanujam and Kanwalroop "Kathy" Dhanda. How many technical books are there out there authored by three (or more females) I wonder?! Looking at the photo of the pool on the New York Times website that accompanied the article on SAS, I was reminded of the corporate positions that I held after receiving my two undergrad degrees from Brown University (and while pursuing my Master's degree from Brown). The positions were in high tech, defense consulting and I was based on Aquidneck Island (Newport and Middletown) in Rhode Island. The intensity of the software research and development work was balanced by runs and marathon training with views of the Atlantic Ocean. Congrats to companies that realize that simply sitting at a computer is not where the best ideas come from! Professor Sam Bowles spoke to a standing room only crowd in our 2009 Fall UMass Amherst INFORMS Speaker Series yesterday at the Isenberg School of Management. The title of his presentation was: The Nature of Wealth and the Dynamics of Inequality from Pre-history to the Knowledge-based Economy. His lecture, which was brilliant, was based on the research behind his co-authored paper in Science, just hot-off-the press, entitled, Intergenerational Wealth Transmission and the Dynamics of Inequality in Small-Scale Societies. The Science article had a commentary by Daron Acemoglu and James Robinson, Foundations of Societal Inequality. Acemoglu of MIT had opened up our Fall 2008 Speaker Series last year. Professor Sam Bowles received his PhD in economics from Harvard and his teacher was the Nobel laureate Simon Kusnetz, of whom he spoke very fondly of. Bowles was moved to work on inequality while a child living in India while his father was the US ambassador to India (he subsequently returned to this position years afterward). Sam Bowles' great-grandfather (of the same name) was the abolitionist editor of the Springfield Republican, and a friend of the Amherst poet, Emily Dickinson. In fact, last week the Bowles family had been honored at a banquet put on by the Republican (I communicated with the present publisher, Larry McDermott, this morning). Professor Bowles began his lecture by saying that he was very pleased to be speaking in an operations research seminar series because he enjoyed learning about and applying linear programming, going back to the 1960s. Indeed, in the lunch that followed his presentation we were treated even to his recollections about his travel to Cuba in 1969 to advise the Ministry of Sugar on transportation problems, using, yes, linear programming models in which there were capacities on the links. I found an interview with Sam Bowles in the Harvard Crimson that was published in 1969 after his return from Cuba. In his lecture yesterday, he graphically (with numerous images of animals, humans, and landscapes from around the world) and mathematically (through an elegant dynamic model for which a long-run steady-state could be determined) explained the variation in inequality in different societies through the extent in which the most important forms of wealth are transmitted within families across generations. The types of wealth considered: material, embodied, and relational (which he illustrated with different network topologies). The captivating lecture ended with a quote from the Nobel laureate Kenneth Arrow (who I have had the privilege of meeting while at a workshop at Stanford University) on information, which he then related to a quote from Karl Marx. A discussion followed on whether patents are needed and how intellectual discoveries and innovations should be priced. Professor Bowles told us at lunch, afterwards, that he gets up at 4AM (which I am sure motivated the students who heard this) because of his passion for the research and problems that he is working on. After Professor Bowles' lecture, we will all be seeing the world with new eyes. We thank him profusely for speaking to the undergrads, grad students, faculty, and visitors, that represent numerous disciplines (management science and operations research, engineering, computer science, economics, resource economics, organizational studies, marketing, finance, and others), who came to his talk yesterday. Thanksgiving is approaching with its heavy travel via planes, trains, and automobiles and what happens one week prior?! A single failure of a circuit board in the FAA's air transportation communications system snarled air travel yesterday. The full story can be found here. It took hours to fix and flight plans had to be entered manually in the meantime, resulting in numerous cancellations and delays throughout the US. In the article, Professor Michael Ball of the University of Maryland is quoted. Ball is a long-time member of INFORMS and a fellow transportation colleague with whom I have had the pleasure of associating with through the Transportation Science & Logistics Society of INFORMS. The society's most recent newsletter can be accessed here. Ball's quote: A good communications system system should have enough redundancy that a failure shouldn't hurt it that badly. Here we go again -- a single point failure with major disruptions in a network. This is another example of supernetworks -- a failure in communications affecting transportation. The Federal Aviation Administration has struggled for years to modernize air traffic control and its associated systems. Coincidentally, while I was completing my PhD at Brown University with a specialty in operations research, I was interviewing with consulting companies, high tech companies, and academic institutions. I had received, interestingly, an offer from the MITRE Corporation in the Virginia area to work on the FAA's air traffic control system. I did not accept the offer (but it was so tempting) even though I was interviewed by a fellow Brown grad (who is now at IBM) Dr. Igor Frolow. Now there are again calls for more funds to fix the problems with the FAA. It's not a simple issue of increased financial funds, but, rather, of thorough planning and appropriate resilient and robust network design. Teaching my transportation & logistics class is always an incredible experience! Today, I shared with my students the New York Times OpEd piece by Bob Herbert, What the Future May Hold, in which he writes: We're trundling along in the infrastructure equivalent of a jalopy, with bridges rotting and falling down, while other nations, our competitors in the global economy, are building efficient, high-speed, high-performance infrastructure platforms to power their 21st-century economies. Herbert then proceeds to imagine an America with rebuilt and healthy metropolitan areas, efficient rail and electric power networks, coupled with world-class public schools. He cites both a Brookings study and Rohatyn's recent book, Bold Endeavors, with the opening sentence: The nation is falling apart -- literally. The themes of our Fragile Networks book focus not only on identifying the vulnerabilities of our infrastructure through the prism of transportation and logistical networks but also how to identify potential synergies through cooperation, through teaming and wise sharing of resources, and even through mergers and acquisitions. Patrick Qiang and I show in our book how to also compute a priori potential environmental synergies by capturing the underlying network structure of firms involved in mergers and/or acquisitions. Today's New York Times also has an article on the environmental costs associated with air travel (which I also shared with my students) in which is stated that the average British commuter while commuting by rail, bus, or car in a full year would emit LESS than a single air traveler flying from London to Los Angeles! Research is now being conducted (and some terrific work is being done right here at UMass Amherst) to develop alternative fuels even using algae, that would drastically reduce the carbon imprint of air travel. The article emphasizes that the effect of carbon offsets at the present prices on emission-reduction is esssentially null (but travelers' guilt might be reduced and that is about it). Mr. Dickenson, of the nonprofit Carbon Disclosure Project, says that he is now taking trains, flying less, and trying to conduct more meetings via phone or teleconference. The article ends with a comment about Warren Buffett's recent investment in the Burlington Northern Santa Fe Corporation. Indeed, what does it say when the world's most successful investor, Warren Buffett, is now purchasing more railroad companies?! As Buffett has joked, This is all happening because my father didn't buy me a train as a kid. Buffett gets the importance of trains for the movement of goods in the United States of America and how environmental impacts can be reduced through mode switching from trucks to trains. By the way, as I told my students today, CSX has a very cool carbon emission calculator for determining the environmental costs associated with moving freight from different origins to destinations via rail. In honor of Warren Buffett's vision, I have featured a photo above of some trains (toy, obviously) from my husband's collection. I have also included a photo of the letter that I received from then Vice-President Al Gore commenting on my book, Sustainable Transportation Networks, and thanking me for it, when it was published. 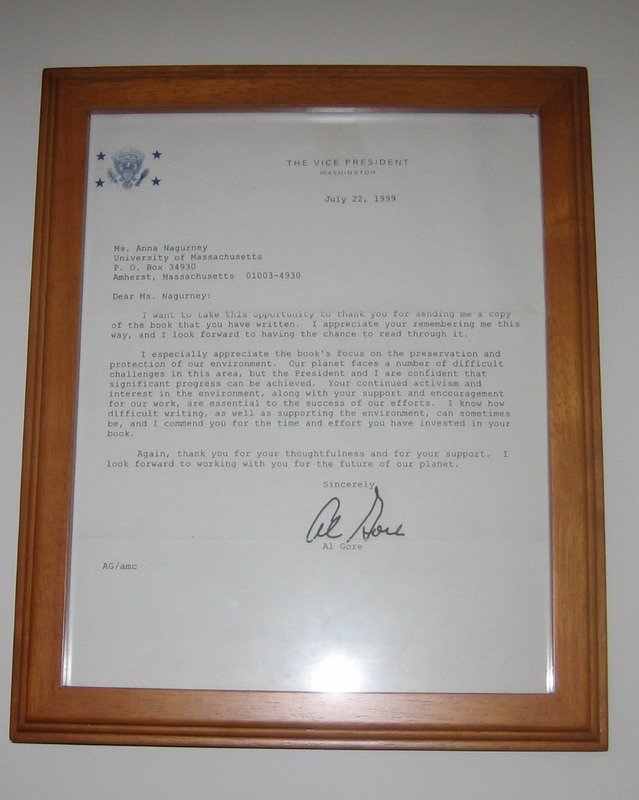 The letter is hanging in my Isenberg School of Management office for my students to see. US Wins the Supercomputer Race! In a study officially released, the US Cray computer, known as Jaguar, is rated the top supercomputer in the world, based on processing speed. The article Science-based US Supercomputer Fastest in the World details how the Jaguar, which is located at the Oak Ridge National Laboratory in Tennessee, was rated the top supercomputer out of the Top500. Professor Jack Dongarra of the University of Tennessee is the co-author of this study, which benchmarks the fastest supercomputers in the world. Professor Dongarra is also the long-serving editor of the International Journal of High Performance Computing Applications, on whose editorial board I serve as well. The article quotes the head of the National Science Foundation, Dr. Arden Bement, who well-understands the significance of high performance computing to solving grand challenge problems. The Jaguar was actually the beneficiary of stimulus funds and it is used to formulate and simulate energy-related problems. It is fantastic news that the US now leads the world in supercomputing speed! The third fastest supercomputer is based at the University of Tennessee, so this is great news for that university. By the way, the new Chancellor of UMass Amherst, Dr. Robert Holub, was the former Provost of the University of Tennessee in Knoxville. A few years back, I had a wonderful collaboration with Dr. Frank Southworth, then of Oak Ridge National Labs, who is now at Georgia Tech. Our paper, with several co-authors, was published in Environment & Planning B and looked at complex supply chains from a multilevel perspective. Forbes has a terrific article on problem-solving via blogs, specifically featuring the math blog of Professor Terence Tao of UCLA. Professor Tao is both a Fields medalist and a MacArthur Fellow and he poses math problems on his blog (as well as lectures and other interesting material). The article in Forbes discusses how through what I would consider collective or community intelligence a problem in mathematics was solved through blog postings and discussions. A paper has actually been generated as a result and more information is available on Professor Tao's website. There have been interesting discussions even by economists about solving problems and generating research papers in this manner with some economists stating that they are actually selfish and rather than standing on the shoulders of giants want to be considered giants themselves. We are finding that our research on knowledge supernetworks (done with Tina Wakolbinger) and that we even presented as a tutorial in London (during one of the few thunderstorms that London has ever experienced) is being used now to construct frameworks in community intelligence. The paper was published in the Proceedings of the IEEE Conference on Systems, Man, and Cybernetics last year and can be accessed here. Given the number of truly important problems that need solution, the harnessing of collective and collaborative approaches for solution can save time, and can generate answers, which are sorely needed. This week we are celebrating International Education Week and our atrium is decorated with flags from around the world. The timing is perfect since tomorrow we will be helping to host a delegation from China that is exploring the establishment of a partnership with our doctoral program at the Isenberg School of Management. Travel and study abroad enriches all the participants and is one of the highlights of education. One of the best examples of international programs is the Fulbright program, which has been in existence for decades. In 2002, I had the unique opportunity to hold a Distinguished Chaired Fulbright at the University of Innsbruck, Austria, and an essay on my experiences appears on the CIES.org page. I have also captured, through photos, some of the magic of living and working in Austria while on this Fulbright. My more recent Fulbright experience took place in March, 2008, when I was a Senior Specialist in Business Administration at the University of Catania, Italy. A webpage to capture the workshop and educational experiences was created and is available here. Tomorrow I will also be meeting with the head of an organization that works in humanitarian logistics and who has done a lot of relief work related to transportation in Africa. Let us all celebrate diversity! Train Wreck Averted -- that was the subject line of a message I received from Professor Sam Bowles this past week with another one titled Miracle. Professor Sam Bowles was scheduled to speak in our Speaker Series next Friday, November 20, 2009, at the Isenberg School of Management. However (and I sometimes feel like I work in crisis management), he had been called to jury duty and it looked as though it would be impossible for him to be let off from this civic duty. This is the eleventh semester that we have been hosting our Speaker Series and as the Faculty Advisor of the award-winning UMass Amherst INFORMS Student Chapter, we have never, to-date, had to cancel or reschedule a speaker (although there have been dramatic close calls). Somehow, through the magic of electronic templates (and despite what the jury contact person told Professor Bowles), he managed to reschedule his jury duty, so, the good news (and miracle) -- Professor Sam Bowles' talk is on for next Friday! The students do such a wonderful job of disseminating news about these talks, that below I share the announcement that went out today. This will be another fascinating and thought-provoking lecture, which is open to the public. I just finished reading Professor Bowles' "hot-off-the-press" co-authored article in Science, and the accompanying commentary, and his talk should not be missed. The next INFORMS Speaker Seminar of the Fall 2009 semester is scheduled for next Friday, November 20, 2009. We are delighted to have Professor Sam Bowles, University of Massachusetts (Emeritus), Sante Fe Institute and the University of Siena, Italy, who will speak on "The Nature of Wealth and the Dynamics of Inequality from Pre-history to the Knowledge-based Economy." Dr. Samuel Bowles is Research Professor at the Santa Fe Institute where he heads the Behavioral Sciences Program. He is also the Professor of Economics at the University of Siena. He taught economics at Harvard from 1965 to 1973 and at the University of Massachusetts, where he is now emeritus professor. His recent studies on cultural evolution have challenged the conventional economic assumption that people are motivated entirely by self-interest. These have included the mathematical modeling and agent-based computer simulations of the evolution of altruistic behaviors by means of multi-level selection and behavioral experiments in 15 huntergather and other small-scale societies. Bowles' current research also includes both theoretical and empirical studies of the role of incomplete contracts in labor markets and financial markets in explaining income inequality. His scholarly papers have appeared in Science, Nature, American Economic Review, Theoretical Population Biology, Journal of Theoretical Biology, Journal of Political Economy, Quarterly Journal of Economics, Behavioral and Brain Science, Philosophy and Public Affairs, Journal of Economic Literature, Journal of Economic Perspectives, and the Economic Journal. His recent books include Microeconomics: Behavior, Institutions and Evolution (Princeton University Press, 2004), Moral Sentiments and Material Interests: the Foundations of Cooperation in Economic Life (MIT Press, 2005), Unequal Chances: Family Background and Economic Success (Princeton University Press 2004), Foundations of Human Sociality: Economic Experiments and Ethnographic Evidence in 15 Small- scale Societies. (Oxford University Press. 2004) and Understanding Capitalism: Competition, Command and Change (Oxford University Press, 2004). He has also served as an economic advisor to the governments of Cuba, South Africa and Greece, to presidential candidates Robert F. Kennedy and Jesse Jackson, and to the World Bank and the International Labor Organization. PRESENTATION TITLE: "The Nature of Wealth and the Dynamics of Inequality from Pre-history to the Knowledge-based Economy"
The copy of Professor Bowles' research in the current issue of Science Journal (Vol. 326, 6 November 2009) as well as a commentary on that, written by Professor Daron Acemoglu, will be available at the talk or can be requested prior to the talk by sending us an email. Abstract: The continuum of inequality in human societies ranges from foraging bands with a strong egalitarian ethos to more highly stratified agrarian and industrial economies. No empirically-tested model of the stability of these differences over long periods of time or of the transitions among them exists. I address this puzzle with a dynamic model in which a population’s long-run steady-state inequality depends on the extent to which its most important forms of wealth are transmitted within families across generations. A new data set allows comparable estimates of the intergenerational transmission of different types of embodied, material, and relational wealth as well as the degree of wealth inequality for 21 historical and contemporary populations. I show that intergenerational transmission and wealth inequality is substantial among pastoral and small-scale agricultural societies (on a par with the most unequal modern industrial economies) and quite limited among horticultural and foraging peoples (equivalent to the most egalitarian of modern industrial populations). These findings and the model thus may help explain why permanent and substantial inequalities in wealth are characteristic of agricultural and pastoral economies and not of hunter-gatherers and horticulturalists. They also suggest a possible dramatic transformation of the dynamics of inequality in the knowledge-based economy. There has been a lot of press lately, and justifiably so, on the recent multiday closure of the San Francisco Bay Bridge and the Lake Champlain Bridge (it looks as though this one will be permanently closed). Closures of such critical transportation links have played havoc on commuting times as well as on the local economies that they connected and bridged. There has been little attention, however, given to the impact of the deteriorating transportation infrastructure on the environment. Our paper, Environmental Impact Assessment of Transportation Networks with Degradable Links in an Era of Climate Change, which is the lead article in a forthcoming issue of the International Journal of Sustainable Transportation, provides quantitative measures to assess the impact on the environment of transportation infrastructure deterioration. It provides environmental impact assessment indices under alternative travel behavior (either system-optimal or user-optimal) and quantifies the environmental robustness of a transportation network subject to the deterioration of the roads, including their outright removal (as in the case of bridge closures or collapses). The paper also demonstrates that travel behavior must be included in environmental assessments of transportation network robustness and the environmental impacts. In addition, and this is quite interesting, we demonstrate that system-optimizing behavior does not necessarily lead to reduced environmental emissions! Indeed, in certain networks, letting travelers behave selfishly and letting them determine their optimal routes of travel individually with no concern for negative externalities results in lower emissions than when a central controller routes traffic so as to minimize the total travel time! Transportation networks are simply fascinating and counterintuitive phenomena associated with them from the Braess paradox on continue to provide important subjects for research, education, and, of course, practice. Today, my students in my undergraduate transportation & logistics class and I had the distinct pleasure of having Mr. Marc Schneider, the President of Phillips-Van Heusen's (PVH) Dress Furnishings Division, who is based on Madison Ave. in NYC, speak to us at the Isenberg School of Management. Mr. Schneider is an alumnus of the Isenberg School and I had asked him to speak on his "life experiences" and "lessons learned." I had met Mr. Schneider last Spring when he came to reconnect with the campus and I enjoyed him so much that when the opportunity arose to have him come back, I could not turn it down. To make the occasion even more festive, and since the students had done well on their midterm exam, I brought Italian cookies from our favorite bakery in West Springfield, which were beautifully wrapped up and beribboned. Having a top executive come to a class is meaningful in numerous ways. Students get to learn from a true expert and they get to ask questions on topics that interest them. This class consists of seniors who are majoring in operations management plus an exchange student from Hong Kong. The students are beginning to job hunt and several have already had interviews with major corporations. Mr. Schneider was simply fantastic and since the majority of the students are from Massachusetts it was especially meaningful for them to see someone else born and bred in Massachusetts who had graduated from the school that they now attend who has been so successful. Mr. Schneider began his career with Macy's in its training program, and held 14 different positions in 14 years, rising up to management. He was Executive Vice President of Bob's Stores and then Senior Vice President of Global Product Management at Timberland, a company renowned for its environmental concerns and emphasis on corporate social responsibility. Prior to his present position, he was President of PVH's Timberland Sportswear Division. Mr. Schneider spoke on the importance of having objectives and a strategy (and emphasized the great professor that he had had at UMass Amherst -- Professor George Odiorne who had written numerous books on Management by Objectives). He told us not to sit on the sidelines, but to always come to the table and to be willing to play the game with a lot of energy. He emphasized the importance of leadership to inspire and to be inspired. He also told the students the importance of relationships and how the people that they know form the "connective tissue" that make everything else possible. He spoke about hiring the individuals who are now Presidents of Coach and Gap, respectively, and the importance of excellent employees. Mr. Schneider also extolled the specialness of travel and the associated experiences. It was so interesting and fun to hear him speak about outsourcing, the bottom line issues of logistics and operations (just perfect for this class), efficiencies in warehousing and the movement of products, and deciding on whether to ship by boat or by air. He even spoke about service associated with apparel in stores and how his company deals with not only Walmart and Target but also with Neiman Marcus and Nordstrom's. He told us that it costs $.50 to ship 1 tie and $3.50 to ship 1 shirt! His business travels take him regularly to Italy (to glorious Como, one of my favorite spots on this planet) and to China (especially Shanghai) and even to Africa. He also spoke about the value equation and asked the students what, in their opinion, constitutes value. Mr. Schneider's energy and knowledge plus passion for what he does filled the classroom and the time was too short (as all great visits are)! Thank you, Mr. Marc Schneider, for your visit today to the Isenberg School of Management at UMass Amherst! You inspired and educated all of us. My Letter to the Editor, provoked by the front page article in last Sunday's Boston Globe on the closure of the Lake Champlain Bridge and the social and economic ramifications, is now online. I blogged about this article last week and also brought it to my transportation and logistics class last Monday to share with my students. Winter is approaching and when the lake is covered with ice, the ferries will not be able to provide an alternative mode of transportation. The closure of this bridge has added as much as three hours to citizens' commutes and played havoc on businesses and workers' and their families' schedules and routines. My letter argues for appropriate education in infrastructure planning and management as well as teaching about the optimization of resources, including funds to improve our country's infrastructure. The letter also argues for the need for leadership to identify which links and nodes should be repaired and better maintained before our infrastructure deteriorates even further. As I say in the letter: Before it is too late, the decision makers need to identify how to best maintain the critical and way-too-fragile networks upon which our society and economy depend. We have the tools but, sadly, we lack the leadership. Indeed, Patrick Qiang and I in our Fragile Networks book provide a wealth of methodological tools to help in the identification of the importance and ranking of bridges and roads. It is high time that our country appropriately invests (and repairs) our infrastructure! E-Z Pass and Infant Health -- Keep the Traffic Moving and Improve Health! I have devoted years of research and teaching to transportation, logistics, and networks, and the associated methodologies that can help in forecasting traffic flows and, what economists call negative externalities, which, in the case of traffic, include both congestion as well as pollution. 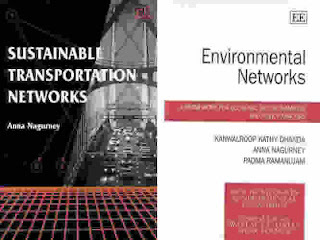 My two books that focus specifically on environmental issues are: Sustainable Transportation Networks and Environmental Networks: A Framework for Economic Decision-Making and Policy Analysis, the latter co-authored with K. K. Dhanda and P. Ramanujam. These two books develop a spectrum of models and associated analytics that can be applied to identify a priori the impacts (both cost-wise and environmental-wise) of changes to networks in the form of design changes or policies. These books also discuss paradoxes that arise in transportation and emphasize how important it is to capture the actual behavior of drivers, firms, etc. A National Bureau of Economic Research study, Traffic Congestion and Infant Health: Evidence from E-Z Pass, by Janet Currie and Reed Walker, which was just released, concludes that reductions in traffic congestion generated by E-Z Pass reduced the incidence of prematurity and low birth weight among mothers within 2km of a toll plaza by 10.8% and 11.8% respectively. This is a terrific example of transportation technology in the form of electronic tolls having a direct, positive impact on community health. Our most recent paper on transportation and environmental issues shows the impacts of road condition deterioration on environmental pollution. The paper, Environmental Impact Assessment of Transportation Networks with Degradable Links in an Era of Climate Change, is forthcoming in the International Journal of Sustainable Transportation. Tomorrow, November 6, 2009, we will be hosting Professor Richard Palmer, who is Head of the Department of Civil and Environmental Engineering at UMass Amherst, in our Fall 2009 UMass Amherst INFORMS Speaker Series. He will be speaking at 11:00AM in the Isenberg School of Management and more information about Professor Palmer and his presentation, which will focus on optimizing water reservoir operations, can be found here. Professor Palmer is relatively new to UMass Amherst having come from the University of Washington in Seattle. He received his PhD from Johns Hopkins University, which, coincidentally, is the same institution at which my doctoral dissertation advisor, Professor Stella Dafermos, received her PhD. In fact, they both received their PhDs from the very same department. Professor Palmer has done a lot of award-winning, fascinating research on the modeling of water resources and management and will be speaking tomorrow on both the use of optimization techniques and simulation in reservoir operations. We are delighted that he accepted our invitation and we are certain that we will learn a lot from his presentation. Last week we did not have a speaker (Professor Palmer is the fourth speaker in our series this Fall) and an undergraduate student of mine sent me a message that he was so disappointed since he learns so much from our speakers and he organizes his Fridays around the lectures. This was such a kind and thoughtful message to receive and makes the work involved in organizing, hosting, and following through with the Speaker Series all the more worthwhile! Also, I very much believe that great speakers spark students' interests in a discipline and that is one reason that I continue (for 11 semesters now) to be so involved in this Speaker Series in Operations Research / Management Science. I would also like to bring to your attention the upcoming talk on November 20 by Professor Sam Bowles, whose co-authored article just appeared in Science on October 30, complete with a commentary co-authored by Professor Daron Acemoglu of MIT, who kicked off our Fall 2008 Speaker Series! NSF even released a press release about this research and you can read more about it here. On December 4, we will be hosting the talk of Professor Brain Levine of the Computer Science Department who will speak on cyberforensics. These talks are open to the public. The UMass Amherst INFORMS Student Chapter does a wonderful job of helping me to organize this Speaker Series. Sports are an activity that brings people together -- from the players to their families, the coaches and staffs, and, of course, the fans. Sports illustrate the best in all of us, from meeting tough challenges, under, sometimes, grueling and difficult conditions, to outstanding teamwork and good sportsmanship. They also provide a means of escape and entertainment (as great literature does). Being a professor at the Isenberg School of Management, among its many positives, is that, besides such terrific departments as Finance and Operations Management (my home), Accounting, Management, and Marketing, we also have the Hospitality and Tourism Management department, the Resource Economics department, and one of the top (if not the top) Sports Management department in the country! Plus, in that department there are even a few Yankees fans. Now that the Yankees have won their 27th World Series and NYC is celebrating tomorrow with a parade on Broadway, as a transplanted New Yorker (via Yonkers), I must say that this is a time to celebrate the Yankees victory! For those of you who are interested in learning more about the analytics behind baseball, you may wish to listen to the excellent podcast on Running the Numbers in Time for the World Series in which Professor James Cochran of Louisiana Tech University is interviewed by Barry List of INFORMS. Other podcasts on different topics are also available on that same link. For now, let's celebrate the specialness and uniqueness of sports! Last week the Computer Science Department at UMass Amherst hosted a national meeting on Cyber security. UMass Amherst was selected as the site for this meeting by the Institute for Information Protection (I3P.org), which is a consortium of leading universities, national laboratories, the Department of Homeland Security, and nonprofit organizations. More information about the two day meeting is available here. The presentation that I prepared for this meeting was entitled: Identification of Vulnerabilities in Fragile Network Systems: Transportation Networks, the Internet, Financial Networks, and Electric Power. The conference brought together 40 researchers for presentations, brainstorming sessions, business and research discussions, as well as social events, including a lovely dinner at the Amherst Women's Club (and for some of my colleagues in engineering and computer science this was the first time that they were in that beautiful building). I had the pleasure of meeting some truly brilliant and extremely nice representatives of this consortium from Dartmouth, CUNY, the University of Virginia, IUPUI, Idaho, and the Department of Homeland Security. In this impressive group were also researchers whose work I had been citing and whose work Patrick Qiang and I reference in our Fragile Networks: Identifying Vulnerabilities and Synergies in an Uncertain World book! I could not resist a photo op! I had become very interested in cyber security while researching the book, Supernetworks: Decision-Making for the Information Age, which I co-authored with June Dong. Our supernetwork team was then selected as one of the nine teams in the US to take part in the National Science Foundation program, Management of Knowledge Intensive Dynamic Systems. The research that we conducted under this project is now being used in many fascinating areas, including cyber trust research. I am pleased to share with you the link to our most recent paper on knowledge networks, which is co-authored with Patrick Qiang. The paper, A Knowledge Collaboration Network Model Across Disciplines, will be presented at a conference at the National Institutes of Health in Bethesda, Maryland. Cyber security research spans different disciplines, and it is extremely important, fascinating, and timely. It is an honor to be included in this truly innovative group. With all the attention the closure of the San Francisco Bay bridge has been getting you may have missed another bridge closure on the opposite side of the US -- that of the Lake Champlain bridge that connects Vermont with New York State. The bridge was closed on October 16, 2009, and it is uncertain whether it will even be able to reopen after the winter. It is a truss bridge and its design is similar to the Minneapolis bridge that collapsed in August 2007, with 13 deaths resulting. The Lake Champlain bridge is a critical link. Its closure has resulted in commuters having to add 90 minutes to their commutes or to wait as much as three hours for a ferry to shuttle them across the lake. Small business owners are losing thousands of dollars a day and healthcare workers are having difficulty reaching the hospital that they work in. The pain and suffering and economic and societal losses are graphically depicted in the article, Lake Champlain Bridge, in the Boston Globe. This is another example where deferred maintenance and inattention to the nation's transportation infrastructure has now yielded substantive losses. It also shows that the networks upon which our society and economy depend are more than just the ties that bind but they are the channels and routes of people and goods flows. Transportation planners and government officials should have realized the importance of the Lake Champlain bridge, whose removal has resulted in rerouting of thousands of commuters, who have had to add substantively to their commutes and/or switch their modes of transportation entirely. A few brave souls are even now crossing Lake Champlain by kayaks! It is so much more than a bridge. We feel like we're cut off from the world. As for the stimulus funds, it is now being reported that over half of the jobs saved were in education; see the coverage in this article, Schools are where Stimulus Saved Jobs, in the New York Times. The funds were also used to shore up, temporarily, many public universities. Educational institutions need to enhance their programs associated with network infrastructure. As more and more schools try to develop "revenue-generation" programs, due to serious pending financial shortfalls, after the stimulus funds run out, as reported in today's New York Times, attention should be given to develop programs that truly help our country to rebuild its infrastructure from its educational institutions to its transportation systems, the financial system, manufacturing and logistical networks, healthcare, the Internet, as well as our energy networks. Stop-gap, "trendy" programs are just quick fixes, if they are fixes, at all.